We all look forward to it—the longer days, bright floral colours, and open patios that come with spring in Halifax. Besides a hike, how can we take full advantage of the warmer weather while we’re on a date? Read on to find out. Halifax is an amazing place for lovers of great food and fine wine. Although we may be biased, the judges and editors of Canada’s Top 100 Restaurants and Top 50 Bars are not—and they agree with us. How often can you say you had a date at one of Canada’s best restaurants? You don’t have to look far when you are at Bishop’s Landing—two of the best are right here on the Halifax Waterfront. Known for its culinary excellence and superior customer service, it’s no surprise that The Bicycle Thief was named #56 on the list of Canada’s Top 100 Restaurants. Now they are officially a destination restaurant not just for our city, but for our country. Book your reservation to taste their North American Food with Italian Soul on your next date. Since they opened in 2016, Little Oak has been receiving acclamation for their innovative, seasonal menu and in depth knowledge of wine. It is this combination that earned them a spot on both Canada’s Top 100 Restaurants (#96) and Canada’s Top 50 Bars (#24). Check out their Instagram account to see why they are the perfect place to take a date to drink beautiful wines and spirits, while eating decadent bites, in a warm and inviting atmosphere. The thing about spring is that we like to do as many things outside as we possibly can. On the Halifax waterfront, we love to soak up the sun and take in the water views while eating, drinking, and listening to music. Good dates don’t need to be expensive—sometimes, they can even be free! Halifax is host to the 2018 East Coast Music Awards. To start the 4-day event, there will be a free ECMA 30th Anniversary Kick-Off Waterfront Concert on May 2, held from 6pm – 10pm at 1549 Lower Water Street. 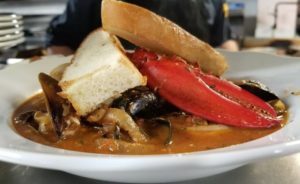 Open City, an annual event organized by I Love Local Halifax, encourages everyone to come out and enjoy specials offered by local businesses under the fresh air of spring’s arrival. This year, the event is on May 12, 2018. To see which businesses are participating in this year’s event, visit the I Love Local Halifax event page. Something about the fresh air in spring makes it just the right time to enjoy a glass of rosé. 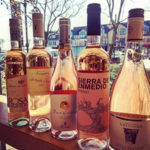 At Bishop’s Cellar, they have a wide range of rosé from France, Spain, and Canada. Some of our favourites are from right here in Nova Scotia Try a bottle from Bishop’s Cellar at your next picnic date. Although there are many fun date ideas to do in spring on the Halifax waterfront, ultimately, the best ones are outside!